PGSM. Character. ルナ Luna is a plushie (stuffed toy). She is also able to talk and walk through CGI. Luna guides the senshi and attempts to keep them on track. 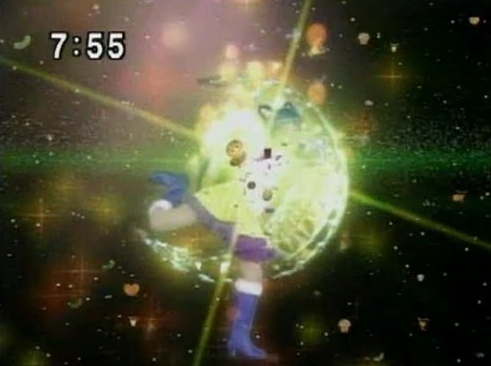 In Act 1, she fell from the sky and landed on Usagi's head. Luna is able to sense both youma and senshi. Her crescent moon glows blue to indicate she has found one of the senshi and glows red when she senses the enemy. In Act26 she turns into a human. PGSM. Transformation. ルナ・プリズム・パワー・メイクアップ Transformation phrase used by human Luna to transform into Sailorluna. It first appears in Act 27. PGSM. Attack. ルーナ・シュクル・キャンディ. Sailorluna uses this phrase to attack an enemy. She shoots little candies and cookies at the enemy. It first appears in Act 29. PGSM. Item. 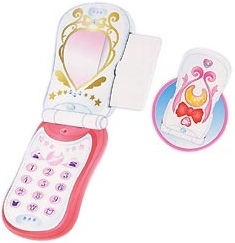 へんしん　けいたい　ルナティア L Communication device used by SailorLuna. This pink phone can be used to disguise oneself as anyone by taking the person's picture. It can also be used as a regular cellphone.